Can you imagine trying to clean up an entire body covered with slime and goo? That is just what my husband and I did tonight. Gelli Baff and Slime Baff... The post Slime baff anyone? appeared first on Blogging Mama. The first day of spring is just two days away. As it slowly but surely makes its appearance here in Belleville, Ontario, it is the time of year when many... The post Spring poses risk for traumatic brain injury appeared first on Blogging Mama. Today I am putting a twist on moms classic meatloaf. I have traded in my go to lean beef and substituted it with ground chicken for an easy to make... The post Easy ground Chicken Salsa Meatloaf Recipe appeared first on Blogging Mama. Ontario weather has brought about a lot of bus cancelations and snow days. If your children are stuck inside during off school days why not grab your supplies and get... 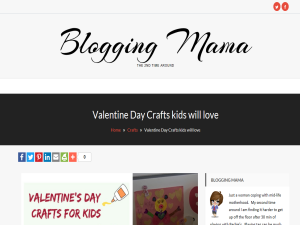 The post Valentine Day Crafts kids will love appeared first on Blogging Mama.